First, I can’t believe that it is 2015 and that January is almost half over with. Secondly, I can’t believe that it is time again for C.L.U.E. 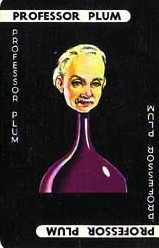 We might cook with plums but we would never harm a soul. Each month our members receive the name of a food blog and a theme. We lurk and hunt through our assigned blog to find a recipe that we adore and that fits the month’s theme. This month our theme was “Something Sparkly” (think champagne, sparkly sugar topped desserts, even sea salt garnished dishes) to welcome in 2015! My assignment this month was Alice from A Mama, Baby, and Shar-pei in the Kitchen where she cooks and bakes while juggling “general chaos.” Alice’s dream is to one day open the perfectly quaint tea house. Alice, I would be first in line. I feel like her food beliefs and traditions are similar to mine. She has some delicious preserve recipes and she is all about homemade. I love that she regularly features a local product and/or farm. A Very Merry Vanilla Birthday Cake because I could add some sanding sugar or silver nonpareils to make it sparkly. The Hubs has a birthday coming up in January but I didn’t want to make his birthday cake this early in the month so it was a pass on this recipe for the time being. 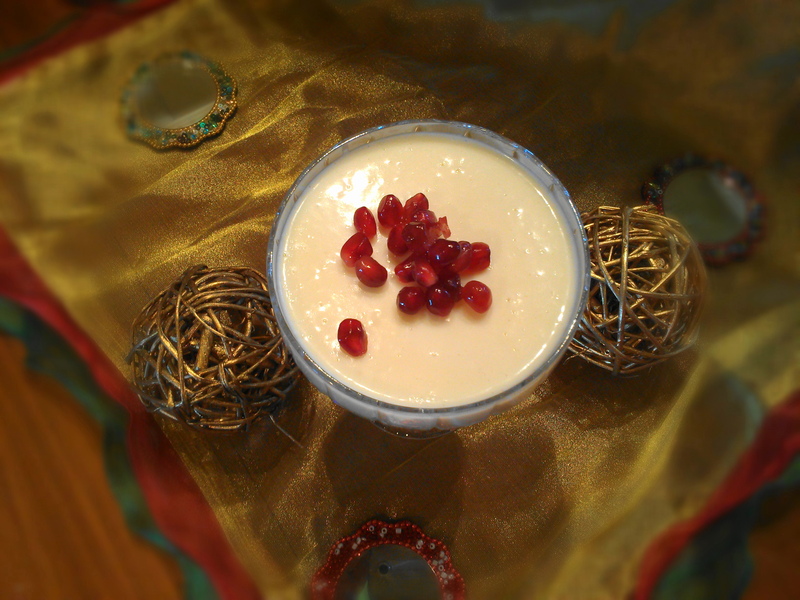 Cardamom White Chocolate Panna Cotta came out as the winner (in more ways than one). Alice developed this recipe after visiting a local dairy facility, Clover Stornetta. I enjoyed reading about her visit and what impressed her at the plant, including the technicians experimentation with expiration dates. To make this rich dessert “sparkly,” I would add some pomegranate arils left over from the holidays, perfect ruby red jewels to celebrate the new year. Place green cardamom pods in a skillet over high heat and cook, swirling the pan occasionally until the pods are charred and burnt in spots, about four minutes. Transfer to a bowl, let them cool a bit then crush to expose the seeds. Transfer the seeds to a saucepan large enough to hold 4 cups of liquid, then add the cream, sugar, 1/4 tsp of kosher salt and vanilla. Bring to a simmer over medium-high heat. Once the liquid is heated through, remove from the heat and steep the cardamom seeds in the cream for 30 minutes, making sure that the sugar has completely dissolved. Strain the cream mixture through a fine sieve into a large bowl. Add the yogurt and remaining salt, then whisk until thoroughly combined. Melt the chocolate over a double boiler and cool before incorporating it into the cream/yogurt mixture. Whisk thoroughly to combine. Bloom the gelatin in 3 tablespoons of hot water then add to the yogurt mixture, stirring until completely combined. *For gelatin blooming tips, click here. Carefully pour or ladle into ramekins, cups or vessel of your choice. Garnish with fresh fruit and honey if desired. This is the creamiest panna cotta I have ever made. (Qualifier: I have only made two or three, but this is superb.) We deduced that the white chocolate was the key to the consistency and creaminess of this dessert. To continue the sparkly theme, I served these in my champagne saucers. I am not done with Alice’s recipes, not by a long shot. I have pinned these three to make as soon as I am able. Please stop by next month as I reveal the next C.L.U.E. assignment. Obviously, our theme for February is red. Thanks for stopping by today. Here are the rest of the Blogger C.L.U.E. Society posts from today, be sure to check out all the sparkly things we made! 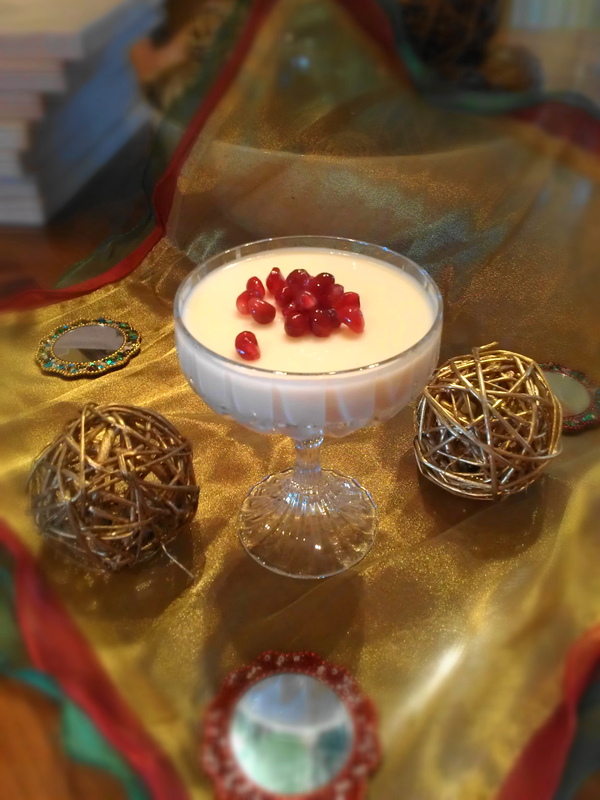 49 comments to Cardamom White Chocolate Panna Cotta for C.L.U.E. That’s a pretty dessert but you have great displays for your food photos. Never made panda cotta, yeah I know, crazy! One day I will give it a shot! Thanks, Tina. Leftover Xmas decorations. Hope you don’t make a “panda” cotta!!!! Oh, my. White chocolate? Cardamom? What an amazing dessert! I know. What a great combination. Alice is a genius! I have never seen cardamom powder, only the pods. I would love to get my hands on some of that, though. I really like the flavor of cardamon. But I don’t have the powder, only the seeds. This sounds delicious and looks so inviting. Glad you chose this one. Yes, I have only ever used the pods. This is really a keeper recipe, Lea Ann. i have never had cardamom with chocolate — sounds intruiging! I am imagining the cardamom with regular chocolate….. I don’t use cardamom enough in sweet things. I should get a clue. 😉 This looks terrific! Thanks for sharing this. Cute, John. Do you have any drink recipes that use cardamom? I love the stuff. We were first introduced to it back in the day when it was an exotic spice for a wassail we made during the holidays. It looks delicious! And cardamom, love it! My Swedish MIL used it all the time when baking pastries so I know it has to be good with your recipe! I really do think it is an under used spice. That cake is probably going to get made this weekend for a special birthday!!!!!!! I will let you know. Thanks for a most excellent recipe, Alice. I love the combo of cardamom and white chocolate. Your panna cotta looks amazing. Thank you so much, Angie. It was a pretty amazing dessert. Yes, I would love some panna cotta…..thank you. You are most welcome, Wendy. 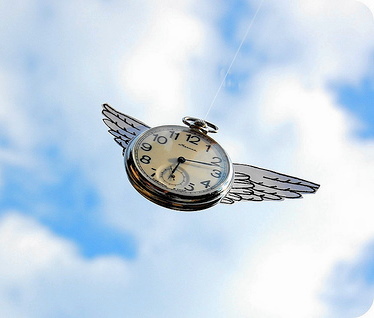 I am vowing to find the time this evening to make it to everyone else’s posts! Oh my, I love panna cotta’s and thought that I tried almost every variation – but I can’t believe I’ve never used cardamom! It’s one of my favorite spices!! Hope you try out this variation, Pam. Oh my goodness. Yeah, I’d say that you chose well. 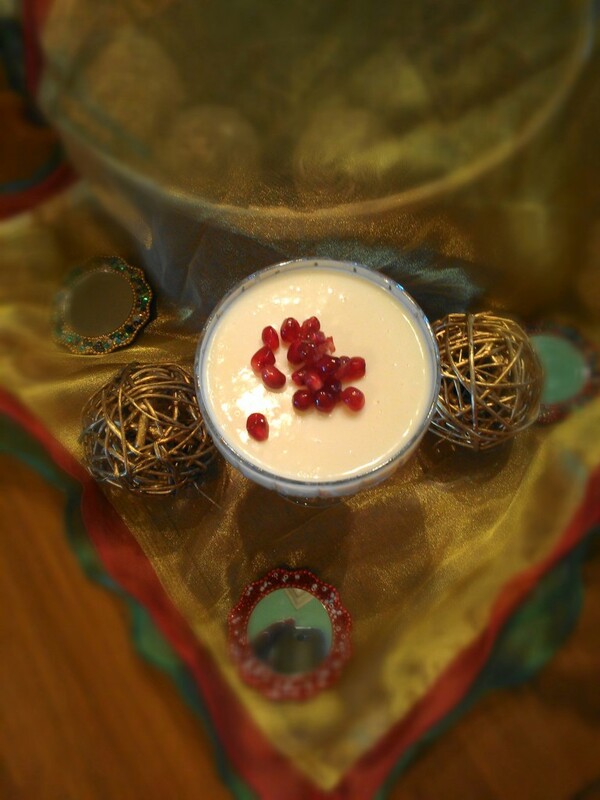 I adore cardamom and white chocolate and panna cotta. Putting all three together is a dream come true. Super dreamy and delicious dessert. Thanks, Christiane! WHat an elegant and sparkly dessert! Great choice for blogger clue society! The pom arils did make it more elegant, but this stuff is good plain, too. I’ve got a panna cotta recipe on my to-do list but as much as I’ve been looking for ways to use more cardamom, I never thought to put the two together. This is brilliant! This was a brilliant recipe! Let’s all thank Alice! Cardamom and whip cream? Come to me! This looks like one heck of a lovely treat. Oh man, this looks so creamy and delicious – and anything scented with cardamom and topped with pomegranates is a big win in my book. Yum! Hey, Heather. Glad you got EE this round and hope you really enjoyed the pretzels. You must try that cheddar sauce, too! I confess that I’ve never made a panna cotta. Because we love flan so much that always wins. I’m thinking this one may be the turning point! The cardamom in this panna cotta sounds so great! I bet it’s super fragrant and delicious! How beautiful! I’ve always wanted to make panna cotta and you made it look so darn easy – I know I’m a week late but this flue has had me in it’s grip for a while and still does. Great job! Hope you’re feeling better, Kelli. You must try this!